True change and advanced human adaptation are not made on the basis of any self-conscious resistance to old, degenerative, and subhuman habits. Change is not a matter of not doing something. It is a matter of doing something else — something that is inherently right, free, and pleasurable. Therefore, the key is insight and the freedom to feel and participate in ways of functioning that are right and new. The tendencies and patterns of your earlier adaptations are not wrong. They were appropriate enough in their own moment of creation, and there is no need to feel guilt or despair about them. Likewise, efforts to oppose and change them are basically fruitless. Such efforts are forms of conflict, and they only reinforce the modes of egoic "self-possession". What is not used becomes obsolete, whereas what is opposed is kept before you. Therefore, the creative principle of change is the one of relaxed inspection and awareness of existing tendencies, and persistent, full feeling orientation to right, new, regenerative functional patterns. 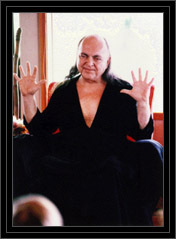 If this principle is practiced consistently and in ecstatic resort to Me, the True Heart-Master, free growth is assured. Have no regrets. Resort to Me in Truth and in the present. All that has been done by anyone had its logic in its time. Only God avails. Whatever is your habit in this moment is not wrong. It is simply a beginning. No habit is necessary, but it is only tending to persist, because it has not yet been replaced by further growth. Hear My Wisdom-Teaching of Truth, and understand what is the right, ultimate, and regenerative pattern of each function of the human body-mind. Feel free of all negative judgments about what you have done and what you tend to do. Turn with full feeling-attention to the creative affair of new adaptation in most positive Communion with Me, the Divine and True Heart-Master, Who is Life, and Who is Alive as all beings.